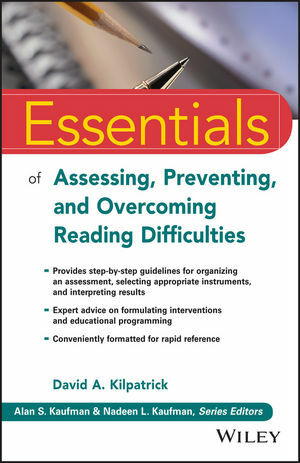 Essentials of Understanding and Assessing Reading Difficulties is a practical, accessible, in-depth guide to reading assessment and intervention. It provides a detailed discussion of the nature and causes of reading difficulties, which will help develop the knowledge and confidence needed to accurately assess why a student is struggling. Readers will learn a framework for organizing testing results from current assessment batteries such as the WJ-IV, KTEA-3, and CTOPP-2. Case studies illustrate each of the concepts covered. A thorough discussion is provided on the assessment of phonics skills, phonological awareness, word recognition, reading fluency, and reading comprehension. Formatted for easy reading as well as quick reference, the text includes bullet points, icons, callout boxes, and other design elements to call attention to important information. Although a substantial amount of research has shown that most reading difficulties can be prevented or corrected, standard reading remediation efforts have proven largely ineffective. School psychologists are routinely called upon to evaluate students with reading difficulties and to make recommendations to address such difficulties. This book provides an overview of the best assessment and intervention techniques, backed by the most current research findings. Reading may well be the most important thing students are taught during their school careers. It is a skill they will use every day of their lives; one that will dictate, in part, later life success. Struggling students need help now, and Essentials of Understanding and Assessing Reading Difficulties shows how to get these students on track. DAVID A. KILPATRICK, PHD, is an Assistant Professor of Psychology at the State University of New York College at Cortland and a New York State Certified School Psychologist with the East Syracuse-Minoa Central School District. An expert and experienced clinician who excels in reading assessment and intervention, Dr. Kilpatrick has conducted over 1000 student evaluations for reading difficulties and disabilities. "Th[is is] literally the best book ever written in our field." "David Kilpatrick's book, one of Wiley's Essentials of Psychological Assessment series, is much more than a synthesis of test reviews, summaries of intervention research, illustrative case studies, and recommendations for reading and literacy interventions. While such content is pro forma in a guide for school psychologists, reading specialists, and educators, this book offers provocative new insights into the nature of reading development, reading difficulties, and effective instruction that deserve wide discussion and application in the field...[This book] represents one of the most potent linkages between science and educational practice available to us now. " -Dr. Louisa Moats, EdD, review from International Dyslexia Association’s Perspectives on Language and Literacy, Summer 2016, p. 51-52. "[Kilpatrick's] book is highly recommended for all school psychologist practitioners. It provides a comprehensive foundation in the research on the development of reading skills as well as an in-depth analysis of how to approach assessment and intervention. Understanding what the research says about how and what to instruct is crucial for school psychologists who are working in a multitiered system of support in order to be able to support teachers in choosing eﬀective instruction at the classroom level and beyond. -Lynne O. Thies, PhD, NCSP, review from Communiqué he Newsletter of the National Association of School Psychologists, Vol, 45, Issue 2, 2016.